Stefan Ritter and a Super Play-by-Play Update! As many of you know, June was not my month with two big crashes in Trexlertown PA. These crashes had me sitting on the sidelines for the rest of the summer. However, spending the summer at home was a nice change of pace. Before I new it, September arrived and my unintentional summer vacation, full of rehab and relaxation, had come to an end. My collarbone and concussion rehab was going very well, so it was time to head back to Milton to start training again. And this time with a new coach - Franck Durivaux. I was really looking forward to working with Franck, as in France he had helped train some of the biggest names in track cycling . . . guys like Pervis, Bauge and D'Almeida. September and October whizzed by, and I was starting to find a little bit of form on the track and in the gym. In early November, I had another small setback. In the final lap of warm up, I was passing a rider coming out of corner four when he decided to swing up without shoulder checking. Always shoulder check! My front wheel got taken out and I hit the deck. A couple of X-rays and concussion protocol tests later it was determined that my head was fine, but I had somehow managed to bend my collarbone. Yes, bend my collarbone and the metal plate that was bolted on to it. After a short period of even more shoulder rehab, I was back - and on the bike. The next week we had some on-track testing and I rode two 10.0 flying 200s. Not bad, but I really wanted to get back under 10 seconds again. One aspect of training that Franck places more emphasis is aerobic power. This meant more road rides and some Madison training on the track, something I was not opposed to! Franck and I even did one 70km ride, which was easily the longest ride I have done in 2 years. Longer rides really broke up some of the monotony of riding on the track everyday, which was really nice. Next up on the calendar, in December, were two UCI C1 races - in Anadia, Portugal and then Grenchen, Switzerland. After a couple days of training it was time to suit up and race. First up for me were the sprints. I qualified first with a 9.993s 200m; and the two Lithuanians, Lendel and Jonauskas, rounded out the top three. The sprint tournament was reduced, as only the top eight riders qualified. I made my way through the quarters and semis, racing Patrice, my teammate, and Sam Ligtlee of the Netherlands. I met Lendel in the final. For those who don't know, Lendel had won the sprint at the World Cup in Chile one week earlier, besting Dennis Dimitriev, the current sprint world champ. It was good competition to say the least. Lendel took the win in two rides straight. Considering it was my first race back, I was pretty happy. The next day was the kilo. The last kilo I had done was at the World Championships in Hong Kong in April, so I was not expecting huge things. After a pretty rough ride, I finished second with a 1:02.7. 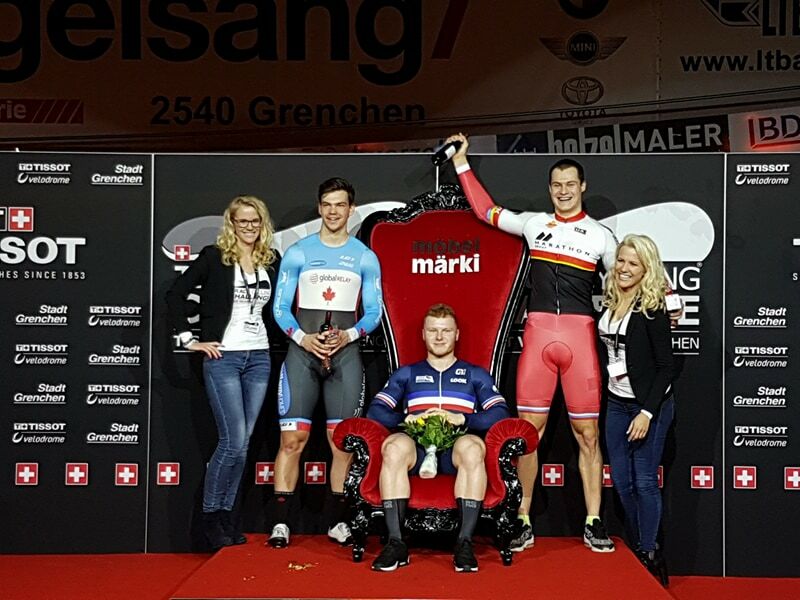 Not the greatest kilo ever, but good enough to get on the podium and get much needed points to qualify for the world champs. It was now time for the Keirin. I drew position one, so I just held the front and razored for three laps, and qualified on to the semis. In the semis, I hesitated (where I should have attacked) right when the bike pulled off; with two laps to go, I was caught three riders high and riding above the blue - I just could not come around. You need to be decisive in Keirin racing! In the 7-12 final I drew position 4, and as soon as the bike pulled off I just went straight to the front, holding the lead all the way till the finish. With a solid three days of racing under my belt, it was time to fly to Switzerland for the next race. First up in Switzerland was the sprint. I qualified second to Sebastian Vigier with a 9.921. After a bye through the 1/8 round, I took Dubchenko to three rides in the quarter finals - winning with probably the best bike throw of my life. Next I was up against Michael D'Almeida. I won the first ride, but made some pretty big tactical errors in the second and third rides; he qualified for the gold final. In the bronze final, I was up against Gregory Bauge, yet another French Olympian medalist, world champion superstar. Bauge took the first ride, but I managed to get the second with really late rush, where I just managed to pass him in corner four. Bauge ended up winning the third ride for an all French podium. In the Keirin, I made it through the first and second rounds without much issue. In the final, I drew fourth position and after the bike pulled off . . . I waited . . . and waited. After one and a half laps, the three riders ahead of me had not picked up the pace at all - so I went. I got to the front and did not look back. Vigier came flying by, but I held on to second through the finish! A great conclusion to a jam packed week and a half of racing. After a great Christmas break at home, and two weeks of training back on the track in Milton, I flew to Belarus for my sprint and Keirin world cup debut! The weather in Minsk was not dissimilar to that of Edmonton - a dry minus 10 degrees, with snow. Our hotel was roughly an 800m walk from the track and along the way was park, a church and a big shopping centre. Four days of training later, and I was warming up for the first round of the Keirin. I drew position five, but made some tactical errors which preempted a direct route to the final. Not the ideal way to start a world cup, but my legs felt great - I just needed to go through the reps now. I drew position five. Again. What luck. Starting at the back, I really only had one option - to rush and get to the front as soon as the bike pulled off. So I did. I made it to the front posthaste, and then just held the front till the end. I had qualified to the semis! In my semi heat I drew position two; as the bike pulled off, there was a big rush and I quickly found myself in fifth position going into corner three. At this point, everyone settled down and the pace slowed, so I launched my counter attack and made it to the front with two laps to go. On the second lap I floated where I could, and then opened the throttle in the last lap, buying my ticket to the Keirin final. Here I found myself beginning in third position. I left a gap, waited one lap, and then I attacked - getting to the front and riding it the exactly as the previous semi. The only difference was that Matthijs Buchli came flying over top of me to take the win. Meanwhile, I went head to head in a race for second place with Lewis Oliva; coming out of corner two on the last lap, I kicked as hard as I could - I knew if I could keep him beside me going into the last corner I should be able to medal. It worked out and I finished second! After about as good of a six hour sleep as you can have, I was up and ready for the sprint tournament. I fueled up with coffee, four slices of rye bread and four eggs, and was off to the velodrome to start warm up. The flying 200's were the first event of the day, and I was able to warm up on track. Three slightly sketchy warm up efforts later, and I was being pushed up the track to start my 200m TT. I hit all my push-points perfectly in my wind up and came swiftly down the banking and into the sprinters lane. I focussed on being smooth, and riding a clean line. One lap later I looked up and saw my time - 9.820. That was a new pb ( Minsk is pretty much sea level)! I ended up qualifying fourth. This gave me a bye to the 1/8 finals where I raced the legend himself, Theo Boss. We arrived at the start line with Theo leading it out. The whistle blew and to my surprise Boss took off like a rocket with a full on standing start. All of a sudden the commissaire's gun fired - it turned out that Boss' coach had given him a very big illegal push. So we restarted, and to my surprise Boss deployed the same tactic yet again. I chase and he starts to ease up going into corner three, so I let off the gas slightly. On the home straight he swung up to the rail and dumped speed. I had two choices: a smart one, and a not so smart one. Instead of following his wheel and maintaining my position in the rear (smart choice), I chose to take the front. Theo ended up coming around me on the last lap in corner four and that was that. The Dutch rider went on to finish third, after qualifying 13th (quite remarkable in itself), which lifted my spirits slightly - knowing that he had also beaten other faster riders. All in all, I was pleased with a second in the Keirin and ninth in the sprint. I came away from the Belarus World Cup quite content with where I had come from since summer, and looking forward to the next two big events on my calendar: The World Championships in Apeldoorn Netherlands, and the Commonwealth Games in Gold Coast Australia! But first, back to Milton to put in another training block. Posted on January 29, 2018 by @Juventus Cycling .